Anytime we ask sports officials what is the most important thing they can do to get better, the answer is always the same: study video. We ask this to officials, at all levels, and it’s always unanimous. Making video study easier, more efficient, and more accessible is why ZOOOM exists today. So, how can you can build a better video training program using ZOOOM? We’ve developed an approach that is taking the officiating world by storm. It’s efficient, it’s easy, and it helps your officials improve faster than ever before. The On-Demand Officiating Training Program puts the power of video in the hands of every official everywhere they go, all the time. So, what does your Intramural Department or Association need to do to make this happen? Step 1) Create a small 3-5 member video committee. They’ll help coordinate your ZOOOM video activities. Step 2) Have the committee upload and tag approximately 8-10 game videos on ZOOOM. This is a great project for the offseason! Step 3) About two-weeks prior to the start of your season, send your IM Department’s or Association’s Preseason Training video to all member officials. You can create the video in about 15 minutes using ZOOOM’s built in tools! Step 4) One-week before the season begins, start sending out weekly “You Make the Call” plays to your officials. Step 5) Over the next 3-4 days the committee will take a look at the “You Make the Call” results. This will give you great insight to where the staff is in terms of play-calling and consistency. Step 6) At the end of each week, share the same “You Make the Call” video again, but this time add your feedback and/or interpretations. This will get everyone on the same page with how you want things called. Step 7) As key plays or new points of emphasis pop up during the season, add those videos to the weekly rotation. 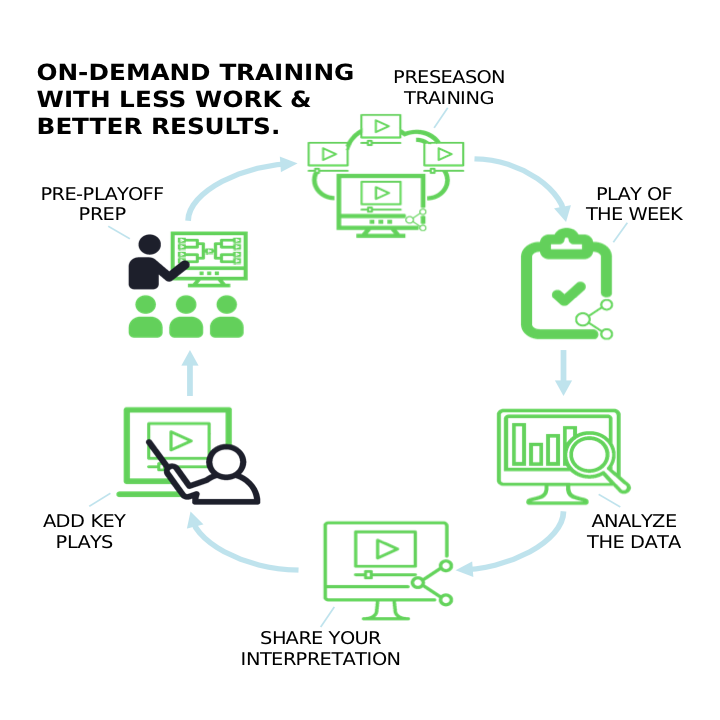 Step 8) Then, wrap up the season with a Pre-Playoff Prep training video about a week before your playoffs start. 95% of the work can be done in the offseason. Then, during the season, all you’ll have to do is click “send”! You only need 8-10 game videos to get the material you need, and by using the ZOOOM tools, you can tag and organize an hour of game video in about 10 minutes! That’s just a little over an hour of work, which can be split by 3-5 people! Once the video is shared, your officials can access it 24/7/365! ZOOOM works on every device with an internet connection. So, your officials can use all the video material you send during pre-game preparations, weekly meetings (which can be held both in person or online), at annual clinics or camps, for post-game review and evaluations. Most importantly, everyone will be using the SAME video, looking at the same plays, the same interpretations, and the same mechanics, so everyone can get on the SAME PATH towards consistency. It’s all just a click away right here!